In my opinion the greatest teachers of young people are those that know balance. If a teacher is too strict and military like, the student loses interest. If they are too soft then they may have fun but never progress. Paul has mastered the art of making music fun and interesting. He'll do things like using different instruments. My son's learning piano but plays viola at school. So Paul will bring out his violin and play some duets with him. He goes out of his way to keep things new and exciting. At the same time, he holds his students accountable for what he knows they are capable of. He truly cares about his students success. As far as expertise, there is no question, Paul knows his stuff! Inside and out. I'm not sure there is an instrument out there he hasn't mastered! And he wants nothing more than to pass that knowledge and passion of music on to his students! Thank you Paul! My guitar instructor, Paul, is one of the most fun and exciting people I have ever met. I have been taking lessons for 5 years and he helps me get better every day. He never gives up on me, whether I am struggling to learn a new song or just messing around instead of being serious. He is always patient and does whatever it takes to help me to learn better. Paul gives many people the gift of art and the joy of music. He is a great musician and a fantastic teacher. I was a little nervous - at 70 starting lessons to learn the harmonica. Paul seems patient, knowledgeable and easy-to-work with. My 8 year old daughter has been taking lessons from Abbey Music for about a year now and she loves it! I appreciate the flexibility Abbey Music offers in that we aren’t locked into just one instrument for weeks on end. One week my daughter feels like playing guitar, the next week she wants to play piano. Of course every lesson ends with singing a few of her favorite songs. So the lessons are very versatile. The instructor, Paul, is very patient with her. He motivates her to push herself when she isn’t grasping something and still challenges her when she does. My daughter’s elementary school’s music teacher was even impressed by how well my daughter could read music. I’m so proud of her achievements and have Abbey Music to thank! 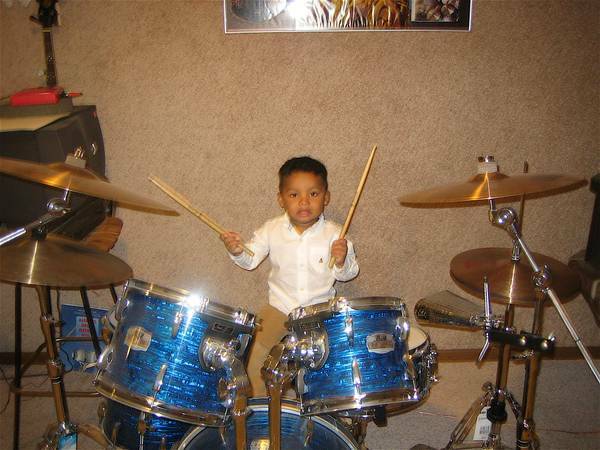 My 3 year old son has been taking lessons at Abbey Music for several months and he truly enjoys it. Introducing him to several instruments at his age is brilliant and I commend Paul for that. He is learning notes as well and I really appreciate Paul’s passion for ensuring that my son is not only learning music and being discipline about it but is also having fun. I started Guitar lessons with Paul at the beginning of this year. The studio is close by so not a long travel time. Paul has been teaching me beginner guitar and teaching me to read music. His directions are simple and concise and I am finally learning something I have wanted to accomplish for a very long time. He is a very talented musician and music teacher. I love to listen to him play as it gives me inspiration. The only lessons that I ever had were in school and public group lessons. I get so much more from private lessons and I wish I had started this a lot Sooner. 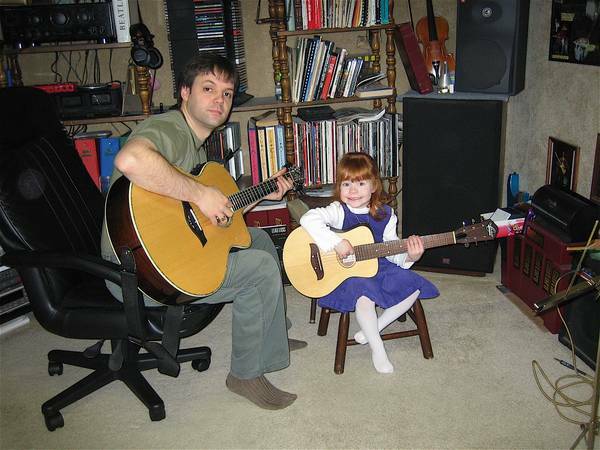 I am a long time student having first started guitar lessons in my late thirties. 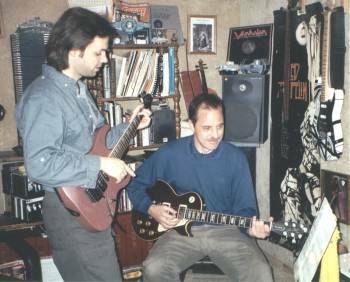 Thanks to Paul’s patience and expertise, I quickly evolved as a guitar player and all around musician. He has a great studio with a full variety of instruments so it's very convenient to not have to bring one's own instrument if one prefers not to. The studio also has a quality recording system , and I've created numerous professional sounding recordings of my guitar playing as well. Today I enjoy playing bass and guitar in a string band and continue to expand my musical horizons with Paul. I think he is an excellent instructor and I highly recommend him for beginners or intermediate musicians of all ages. I love Mr. Paul's style of teaching. I believe it takes much passion and patience to do what he does. My son actually looks forward to going to music lessons. I appreciate the way he gets my son to listen and understand what's being taught to him. Paul is a very patient and persevering teacher, he is particularly adept with the reluctant or difficult child, he never stops being encouraging and is dedicated to instilling knowledge to the child. I've had a very good experience with Paul and feel my child has gained some valuable musical knowledge at a young age which will become increasingly useful as time goes by. Too long of a story, just disappointed. He's a very talented musician just didn't meet fair/prompt customer service standards. I've been getting lessons with Paul for about 6 months. Great experience so far and my guitar playing has improved significantly. I am a 30 year old beginning singer and started lessons with Paul a couple months ago. Paul is very good at gently breaking one's bad habits. He sensed what level i thought i was on and then helped me take a step back to where i should have been-the basics. He is honest and not afraid to tell you when you are doing something wrong which is good for me because I feel I learn better from how not to do something rather than how to do something. He taught me that singing is way more than just vocal exercises and singing your favorite songs. It is a way of life that includes building one's confidence and knowing thyself. I would recommend Paul to any singer and I will continue to take lessons as long as i need to. This is a great place to take your kid for lessons. he has a great learning plan for children. The kinder music for my 3 year old grandson is awesome. My grandkids love it there. The environment is nice, clean, and safe. There is a waiting area ear shot for the parent or you can get involved. I have noticed great improvement in listening and comprehending with my 7 year old grandchild that has a learning disability. He gets a chance to play all the instruments and is taught something about each one each time he comes. Plus there are instruments for sale if needed. I have even learned something's myself. I would recommend ABBEY MUSIC as a great place to get started and grow. Paul is a charismatic instructor. He has a unique approach to motivate the musician to remove all blocks from their thinking while they continue to improve in their art. I have been singing for years. The first session I had with him, he really helped me "hear" what I was not doing correctly. No other voice teacher had taught me to record and listen to myself. Since my first session, every session holds a new unlocked door to improving my voice ability. Abbey music is a fantastic place to learn music and grow musically. Paul is very patient with all his students. He is well versus in all musical instruments, plus he gives you the option of what you want to learn. If your thinking about starting lessons or finishing yours Abbey music is the place to be, also if you would like to start your toddlers in music. Abbey music has them in mind with smaller instruments that will suit them perfectly. I always wanted to learn how to play guitar and to read music. Paul make learning music fun and easy. When I decided to take guitar lessons I was a little nervous. I thought that it would be hard for me to learn since I'm no longer a child. What I was thinking was that you can't teach old dogs new tricks, not that I'm an old dog. I decided to do it anyway. Paul made everything easy to learn and I did learn new tricks so to speak. He definitely a good teacher for young and old alike. I highly recommend Abbey Music to anyone from beginner to advanced learner. Paul Neathery is an excellent instructor and truly motivates me to keep learning. The studio is well equipped for all types of music instruction. The lessons are timely and the lesson plans are followed well. I've been working with Paul for a few weeks now and he totally gets my vibe and understands my avant garde, nonconventional methods used to notate, compose, write, arrange, and play piano pieces.He's taking my work in directions I would never have imagined. I always come away with a new concept, theory, vocabulary, and to do lists that will take me to the next level. We study artists that inspire me. He breaks down my compositions into sections again emphasizing the correct musical language teaching me beyond my expectations. 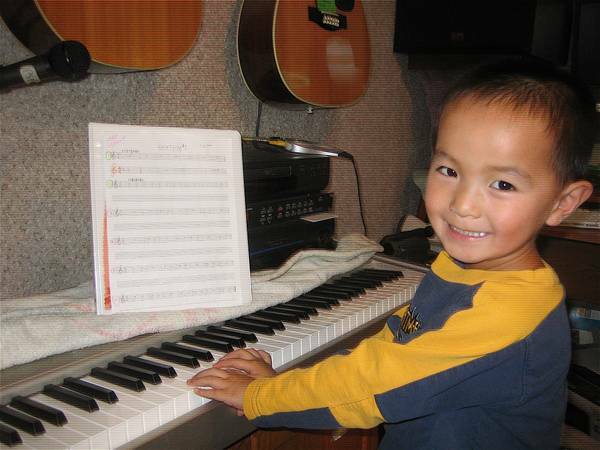 Upon first meeting, his 4 year old son was playing his keyboard, counting the beats, natural rhythym, and this little dude could play a tune with natural ability. It doesn't matter whether you are 4 or 94. Paul is the go to. He's dynamic, plays every genre, writes, instructs on many instruments, takes his gift and gives you the tools to explore this fantastic journey we all love. The musical art form and what it becomes is the masterpiece we get to hear, develop, and become inspired by with his library of musical goodies. I would highly recommend this artist, musician, composer, teacher. His personality works well with all ages, backgrounds, enthnicities, cultures, etc. Thank you, Paul, for taking me on the journey. My teacher, Paul Neathery, is a dedicated professional. He always wants the best for his students. Paul is a very talented musician. I highly recommend him. Whether you, or your child wants to learn guitar, bass, drums, piano, voice or trumpet, Abbey Music is your choice for musical excellence! I've been taking lessons for over 3 years and my teacher is really good at helping me see all my potential. He really wants all the best for his students and they get to make recordings of their songs. I highly recommend Paul at Abbey music for vocal lessons. My 10 year old son has been taking lessons from Paul for a few months now and has learned a lot about different techniques to help improve. He is also flexible with our schedule when we can't make our regular time. My 6 yr old daughter started taking piano lessens with Paul about 8 months ago and absolutely loves it! He is very knowledgeable and well equipped to accommodate students of all ages as well as a full range of instrumental interests. He takes the time to go beyond just the mechanics of playing the instrument and teaches the true art of hearing and appreciating the music. I highly recommend Abbey Music. Paul is an excellent teacher. He was kind, patient and willing to work on whatever it was that our daughter wanted to work on. He not only taught her guitar, but helped with her writing and some recording aspects as well. She was a teenager and loved her time she spent with Paul. She has been very successful so far in her music career and it all started with a passionate music teacher. My daughter is new to guitar. Paul is very patient and friendly, and the student chooses the pace of learning. She's only on her third lesson, but we are confident that we'll be sticking with Paul. 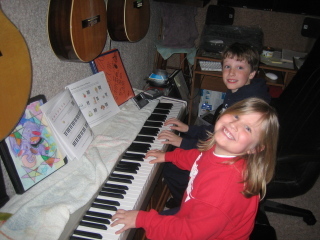 After about a year of music lessons I am very happy with how far my son and daughter have come! They both enjoy their weekly music lessons for guitar and piano! Abbey Music is a very private and welcoming environment and I like how the teacher takes his time on teaching the theory and basics of rhythm and timing. My son is expanding his knowledge of musical theory with Paul. My daughter is a new student for drums although she has experience with other instruments. She really seems to be learning a lot with Paul. Paul quickly helped me get started from zero knowledge. Paul is a wonderful instructor! My daughter has been taking singing lessons with him for a couple of months now. She was very nervous and shy at first, but he has really brought her out of her shell and is making her much more confident! He has wonderful ideas and techniques that are not only helping her improve, but really encouraging her. She loves her lessons and looks forward to them every week! I will be taking my 3 yr. old son in for kindermusik lessons in the future!! At Abbey Music, I like that my 7 year old is able to try guitar, piano, sing, and learn how to read music in her weekly lessons. After just a couple months of lessons we discovered she really likes guitar. Not only am I impressed when she tells me the names of the strings, or music notes, but I know her teacher is doing a great job because she is able to retain the information she learns from week to week. It's not easy to keep a child's short attention span but Abbey Music makes learning music fun! I am so happy that we found Abbey Music. Lessons for myself and my two daughters. Paul has made this a great and rewarding experience for all of us. He is patient and versatile. We just finished recording some songs in the studio together on a CD where we played all the instruments. That has made lessons more exciting and more motivating to want to practice and get better. The teacher is a knowledgeable and experienced instructor who cares very much about not only teaching fundamentals but also fun songs that I'm interested. I can bring in my own CDs no matter what style and he writes them out for me. Trinity was 2 1/2 when she started the Kinder Music Program and has been taking lessons for 2 years. She has had great improvement in her music ability! She sings louder and knows the notes and how many beats they all get now. The teacher is very good with her and has patience and understanding of what it takes to make her a good musician. She learns on the keyboard, drums, and guitar and loves them all. The teacher is very good and I was lucky to find a person who offers a program for such young children. I would recommend Abbey Music to anyone. Trinity also has memorized all of the parts of the guitar and the string names. The studio is what a studio should look like for children, with all of the instruments available to the students. I could go on and on, but you should enroll and find out for yourself. Abbey Music has been a benefit to both my 4 year old, Joshua, and my 6 year old. They started over a year ago and both are learning the importance of music. 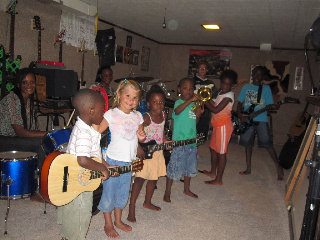 They have learned notes and the strings on the guitar along with how to strum, pick, and mute. Paul has helped them hold their fingers and allowed them to experiment with different instruments including the acoustic and electric guitar, drums, and piano. They both enjoy them. Paul has a lot of patience and is good at getting his lessons across to the younger kids, even those with short attention spans. Music lessons with Paul at Abbey Music has helped them with math in school and with letter recognition. 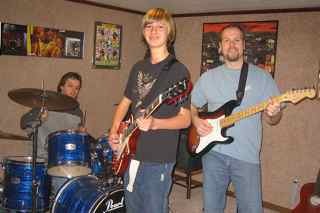 Music lessons also give my sons a sense of pride in their own accomplishments and makes me proud of them too. Paul is a very patient and careful instructor. My son has been taking guitar and piano from him for 4 months, and his progress has been amazing. I've never once seen Paul get angry or frustrated. I would highly recommend Paul as an instructor, especially for guitar. Both me and my 3 year old daughter have been taking lessons at ABBEY MUSIC for a year. I like the fact that the teacher makes sure I learn correctly with all my music. He's more than a teacher, he makes things fun and he teaches not just how to play a simple melody, but how to understand it and learn from it. I like that there are very good lessons for my 3 year old. Emma learns fun musical lessons and learns how to be creative with her young ideas. I notice that she is learning so much more than just music. She's learning how to learn many other things, like math.